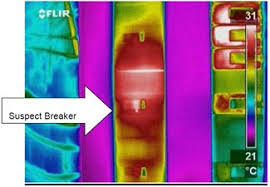 Infrared electrical inspections find hot spots caused by defects in connections and components. Infrared thermography is used to find areas of excess heat (caused by increased resistance) so that problems can be corrected before a component fails, causing damage to the component, creating safety hazards and productivity loss. Because increased heating is a sign of failure, infrared is the best diagnostic tool available for finding these hot connections in the early stages of degeneration. This is why your insurance company may have asked for an electrical infrared inspection, to find and prevent problems before they cause damage to your personnel, equipment and facility. Infrared Imaging Services LLC performs Electrical infrared inspections in accordance with the Infraspection Standard for Infrared Inspection of Electrical Systems & Rotating Equipment. These images from an electrical infrared inspection show overheated connections. The left image is an 800 amp switch with an internal connection problem overheating the bottom right wires. The right image shows heat generated from a loose connection on the top wire. EMA is a firm of structural engineers , Forensic engineers, & Threshold inspectors providing engineering services in in Florida, Louisiana, Mississippi, Texas & New York. Our Structural Forensic Engineering practice, primarily specializes in structural engineering, forensic engineering, Damage inspections and assessments, roof damage inspections, wind damage inspections, cause & origin investigation for building collapse, failure, moisture intrusion, storm damage to buildings, hurricane damage inspections, threshold inspections, Infrared Inspections, structural defects, structural collapse, Thermal imaging, Infrared Inspections, structural engineering services, construction defects, infrared imaging Surveys, roof moisture surveys in Florida, Louisiana, Mississippi, Texas & New York. We provide our services to Insurance Careers, Independent Adjusters, Building developers, Architects and contractors. Copyright 2015 structuralforensicengineers.com. All right reserved.